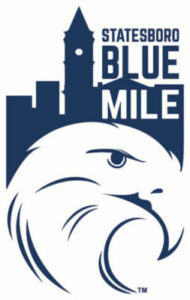 The Blue Mile is project of the South Main Street Revitalization Committee. This committee is a grass roots organization made up of community leaders, volunteers, and organizations. This goal of this committee is to upgrade and enhance the South Main Corridor and to encourage the private redevelopment of outmoded, highway-oriented commercial development into pedestrian friendly, mixed-use centers to achieve the vision set forth in the 2011 Statesboro Downtown Master Plan and 2014 Comprehensive Plan. In reaching this goal, the committee hopes to restore the one mile stretch of South Main Street from the entrance of Georgia Southern University to the Courthouse in Downtown Statesboro to its former glory in a manner that adds economic value to the city’s tax base, beautifies residential and commercial areas, attracts and retains creative students and young professionals, and enhances the quality of life. In March 2015 this group became aware of a national economic development competition that was being spearheaded by Frontier Communications to spark ideas leading to economic vitality and sustainable growth in small towns and rural communities. The sponsors – Frontier, The Weather Channel, DISH and CoBank – invited communities with populations between 9,500 and 80,000 to develop and enter creative plans. A month later, Statesboro was named atop 50 (quarterfinalist) from over 350 entries and progressed to additional rounds that included cash prizes. A semi-finalist in January 2016 (top 15 winning $50K); a finalist that April 27 (top 8 winning $100K); and a winner in April 2017 at a Denver, CO, summit (top 3, winning $1 million as well as $200,000 in wireless technology equipment from Cisco corporation). In April 2017, Statesboro was named one of America’s Best Communities, winning $1 million. The Blue Mile Plan, as it is now known, is built on community engagement and sustainability. There is a place in carrying out this nationally recognized plan for anyone who wants to participate. See ways YOU can help with the Blue Mile!